*I always try to solve the puzzles without moving the pieces. 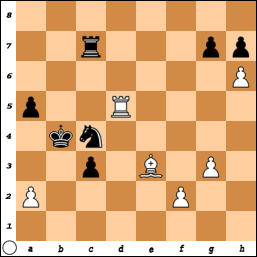 Chess puzzle #15 dead end? It seems that the black attack came to a dead end. That’s too bad, because he invested a whole rook in the adventure. 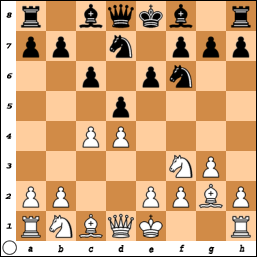 The rook on a8 and the bishop on c8 are passive bystanders and of no use for the attack. At first glance nothing works. For instance 1. … Nxe2+ is met by 2. Nxe2 Qxg4 3. Kh2 Bd7 4. 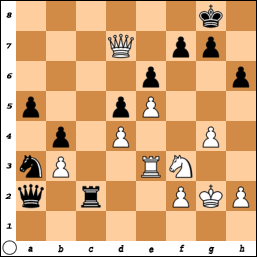 Ng3 and white has the upper hand. Other moves seems to go nowhere either. So is it hopeless for black? On the contrary. He has a win. For you to find out how. Some time ago I raised the question ‘what is your ideal game?’ I favored short and decisive games. Of course I wasn’t too serious. Winning a game without too many mistakes is my ideal. Preferably I dont give my opponent any chances and try to squeeze him. 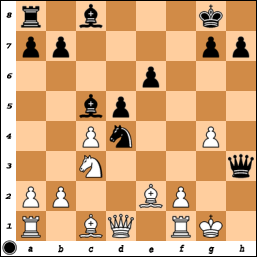 A game I played with white in our club championship comes close to this ideal.